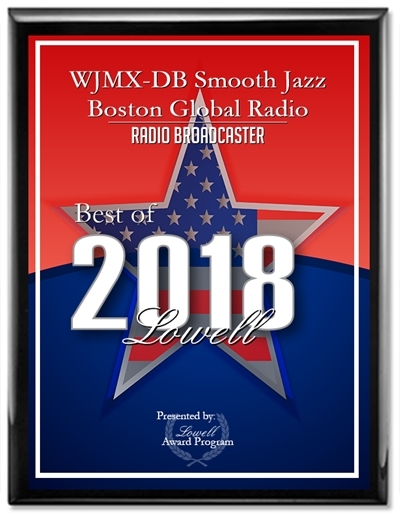 Lowell, MA December 14, 2018 -- WJMX-DB Smooth Jazz Boston Global Radio has been selected for the 2018 Best of Lowell Award in the Radio Broadcaster category by the Lowell Award Program. WJMX, thanks all of the amazing and talented artists that we broadcast for. Without all of your world-class music that keeps the station sounding LOUD, CRISP, VIBRANT, COLORFUL, and DIVERSE, this award would not have been possible. We appreciate all of you! A special thank you to all of our loyal listeners from around the planet. We have added new features to the site. SmoothJazzBoston.com respects the intellectual property rights of others and expects its users to do the same. In accordance with the Digital Millennium Copyright Act of 1998, the text of which may be found on the U.S. Copyright Office website at http://www.copyright.gov/legislation/dmca.pdf, SmoothJazzBoston.com will respond expeditiously to claims of potential copyright infringement committed using any of the SmoothJazzBoston.com Service. If you are a copyright owner or authorized to act on behalf of an owner, please report potential copyright infringement by completing the following DMCA notice and delivering it to the SmoothJazzBoston.com Designated Copyright Agent. Upon receipt, SmoothJazzBoston.com will take whatever action, in its sole discretion, it deems appropriate, including removal of the potentially infringing material and/or termination of the potential infringer’s account. 2. Identify the material that is claimed to be infringing or to be the subject of infringing activity and that is to be removed or access to which is to be disabled, and information reasonably sufficient to locate the material. Providing URLs in the body of an e-mail is the best way to help us locate content quickly. 3. Provide Information reasonably sufficient to permit us to contact you, the complaining party, such as an address, telephone number, and, if available, an e-mail address. 4. A statement that you, as the complaining party, or as one who has authorization to act on behalf of the copyright owner, has a good faith belief that use of the material in the manner complained of is not authorized by the copyright owner, its agent, or the law (e.g. “I hereby state that I have a good faith belief that the disputed use of the copyrighted material is not authorized by the copyright owner or its agent”). 5. A statement that the information in the notification is accurate, and under penalty of perjury, that the complaining party is authorized to act on behalf of the owner of an exclusive right that is allegedly infringed (e.g. “I hereby state that the information in this notice is accurate and, under penalty of perjury, that I am the owner, or authorized to act on behalf of the owner, of the copyright or of an exclusive right under the copyright that is allegedly infringed”). The process for counter-notifications is governed by Section 512(g) of the Digital Millennium Copyright Act: http://www.copyright.gov/legislation/dmca.pdf. To file a counter-notification with us, you must provide a written communication that sets forth the items specified below. Please note that under Section 512(f) of the Copyright Act, any person who knowingly materially misrepresents that material or activity was removed or disabled by mistake or misidentification may be subject to liability. We enforce a policy that provides for termination of users who are repeat infringers. Accordingly, if you are not sure whether certain material infringes the copyright of others, we suggest you contact an attorney. 1. 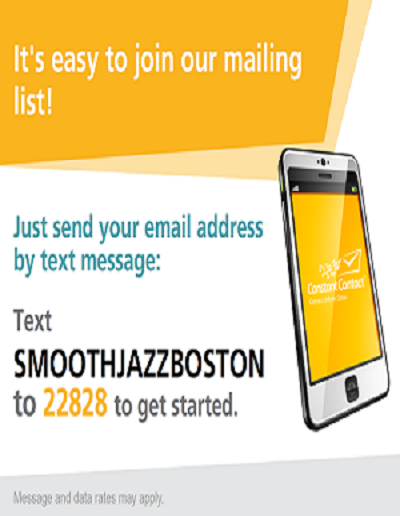 Identify the specific material that SmoothJazzBoston.com has removed or to which SmoothJazzBoston.com has disabled access. 2. Provide your full name, address, telephone number, and e-mail address, and the username of your User Account. 3. Provide a statement that you consent to the jurisdiction of Federal District Court for the judicial district in which your address is located (or King County, Washington if your address is outside of the United States), and that you will accept service of process from the person who provided notification under subsection (c) (1) (C) or an agent of such person. 5. Sign the notice. If you are providing notice by e-mail, a scanned physical signature or a valid electronic signature will be accepted. After we send out the counter-notification, the claimant must then notify us within ten (10) days that he or she has filed an action seeking a court order to restrain you from engaging in infringing activity relating to the material distributed via SmoothJazzBoston.com. If we receive such notification, we will be unable to restore the content until resolution of any court action. If we do not receive such notification, we may, in our sole discretion, reinstate the content. WJMX-DB Smooth Jazz Boston Global Internet Radio broadcasts the very best of Contemporary Smooth Jazz for over 500 of the worlds most talented Artists, both independent and mainstream, to our valued listeners, globally. We also provide airplay and profile listing for Smooth Jazz Artists, free of charge. We provide airplay/broadcasting (24/7/365) for our Artists members to facilitate/promote the success of their brand and music. Helping to promote talented and exceptional contemporary Smooth Jazz Independent and signed Artists is our passion. Add To Playlist (look for the music note symbol) when viewing a profile. click it to add the music to your profile). Support Tickets (for bug reports, help, or question about how to use the site). We will respond back to tickets within 24 hours, or less. Welcome to WJMX-DB Smooth Jazz Boston Global Radio's New Website. WJMX-DB Smooth Jazz Boston Global Radio broadcasts the very best of Contemporary Smooth Jazz of over 500 of the worlds most talented Artists, both independent and signed label, to our valued listeners, national and worldwide. We also provide airplay and profile listing for Independent and Signed Smooth Jazz Artists, to include Amazon and iTunes link to support the sale of their music.